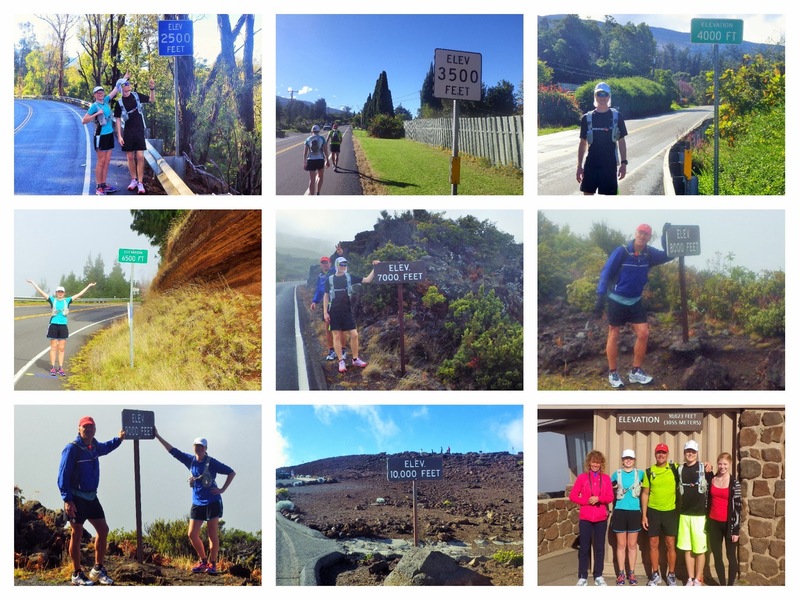 Trail Effect: Why the Haleakala did we do that? Our run up Haleakala, a 10000 foot high volcano on Maui, was ultimately successful, but our adventure was certainly not without some bugs and hiccups. Chris trying to touch the ocean in Paia. We started out at sea level in the town of Paia at 6:25 am. It rained the night before and is just clearing up as we are starting. The puddles however are still able to claim a victim as my dad (Brad) soaks a shoe before we even get going, oops! Anyhow, the starting conditions are nice and cool, and it's just getting light enough that we don't need to bring a headlamp for the portion before sunrise. The first bug I encounter is at about mile 1, when I actually inhale a bug... immediately after my dad warns us about the swarms of them under the street lights! The bug gets lodged in my upper throat and I begin coughing and heaving as I'm unable to get it out. In a near panic at the inability to breathe without extreme irritation of my throat and the thought of having to pull-out of our run up Haleakala, I try drinking, eating gels and clif bars, and we even try flushing water through my nose (seemed like a good idea at the time). That still doesn't help! The darn bug is stuck in there for good, I'm sure of it! Eventually, after about 2.5 miles and 45 minutes of having this bug in there I manage to get it loose and cough it out. Turns out it's a beetle, no bigger than an ant! Of course through all that my throat ends up terribly irritated, something I dealt with for the rest of the run. Between the bug incident and mile 13 there really isn't too much excitement; we see numerous rainbows, have some great views of the ocean beyond the farmlands, we run through the town of Makawao, refill our hydration packs with a hose at the Kula lodge and restaurant, and finally reach the turn up Crater road toward Haleakala summit. From here we only have 22 miles to the summit (which were all conveniently marked so we could count down to the top!). Although the climb so far has been steady, the remaining section will prove to be the toughest as it is exclusively switchbacks up the mountain side. Reaching 4000 feet elevation we are engulfed in a misty cloud, though we quickly climb out of it and get back into the sun. We’re all still feeling pretty good at this point, but by the 6000 foot mark Jenna is starting to have some difficulty with lactic acid build up in her legs. We catch this fairly early on and get her eating and drinking, and she takes some tums to help buffer things. With a quick recovery we continue our slow but steady trek up to the 7000 foot mark where we enter the national park. After refilling our packs again at the visitor center we hit rain! Blowing, cold rain! Obviously we all put our jackets and gloves on, but by 8000 feet we are all getting pretty cold (I’m pretty sure my dad’s lips are blue). Luckily, my mom and sister (our ride down) pass us here and are able to give us a change of clothes and some extra unexpected candy (THANK YOU!) to power us until the rain ends at 8500 feet. At 9000 feet it clears up and we can see the observatory and the visitor center at the top of the mountain. Only 4 miles left, not too tough! Except that we’ve already went 31 miles (50km) and climbed the equivalent of 3 Grouse Grinds back to back! Not surprisingly Jenna develops an exertional cough over 9000 feet that makes it really difficult to breathe deeply, so her and I walk the last 4 miles while my dad 'runs' the last bit to get the pain over with. We finish the ~35.5 mile trek in about 8h45m (that includes my time inhaling bugs). The most surprising post-run revelation is that we got sunburnt despite the cloud and rain for most of the day! Jenna’s legs and the backs of her arms and hands are quite red, while my calves are. The sun must have been pretty strong from 9000 to 10000 feet. After all that, I would still have to say the worst part was the car ride down! Although it was amazing to see how far we’d gone (seriously, why would anyone run that far uphill), those switchbacks sure made us nauseous! -Running through a lavender farm – smells delicious! Paint Run by numbers, all the way to the top of Haleakala at 10,023 feet. It was great to finally get to be part of the adventures that inspirational athletes such as yourself and Chris take on!! I must agree that a beach day sounded like a pretty good alternative! Very glad we hung in there anyhow! I look forward to more adventures in the future!